I am a bit at a loss for words. How can I do a post like this justice and adequately give due glory to God? I can’t… I still can’t believe that this is a real post that I get to type. But let’s see if I can put some words together. It might be a little disjointed. It’s been more than two years since we started trying to get pregnant and a year since we started down the “infertility” road. After being told last spring that we had a 1% chance of getting pregnant naturally, I clung to the idea that my God is a God of the 1%. He is the God of the impossible. If He choses, He can make it happen. We just didn’t know, in His sovereign plan, if He would choose to do it. There were many days where I didn’t think it would ever happen. He has taken us down quite a journey, especially over the last 6 months of seeking treatment. Four months in a row of attempted IVF cycles will do a number to your emotions. As I typed out my last post, about how God had to take me to a place of brokenness to really start to find a hunger for Him, we were in the midst of our 4th attempt. (Only our 2nd where we were actually able to do an egg retrieval & embryo transfer.) 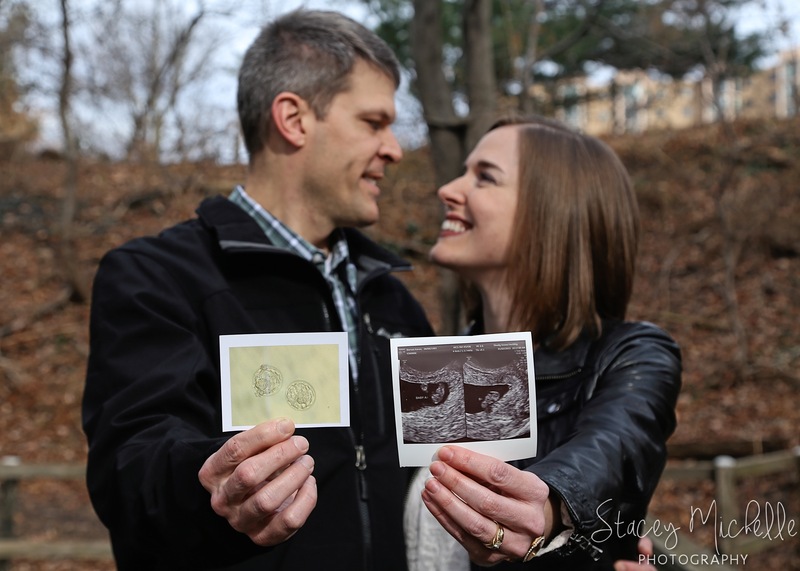 We made it all the way to the embryo transfer and were in the excruciatingly long 2-week wait before the pregnancy test as I hit publish on that last one. God knew the journey He had to take us on. For some reasons we see now and others we’ll never know. Because of my previous response (or lack of response) to treatment — including the one unsuccessful IVF round where we had one embryo to transfer — we decided to transfer 2 embryos this time around. We took the risk. We found out we were pregnant before Christmas and were able to share the news with both of our families as we saw them in person over the holidays. It was the best and only present we needed, and a welcome miracle at the end of a hard year on both sides. This past Friday, we went for our first ultrasound where they discovered that it is, in fact, twins. (For about two minutes we thought there was only one, but the second one was hiding a bit!) Both decided to stick around! We saw two tiny miracle hearts beating, at only 7.5 weeks. Wow. We are so grateful and also quite overwhelmed! Twins! How in the world are we going to handle twins? There are so many logistics to figure out in the next several months. 1. We are not in control. Only God is. We could attempt to take matters into our own hands — I tried acupuncture, a special fertility diet for 6 months, 4 months of medical treatment where we could try the exact same combination and my body would respond differently every time — but it is only God who has any control over the outcome. It’s all in His hands. 2. God provides. We’ve experienced this in not having any idea how we were going to pay for such expensive procedures and medications. But month after month, God provided, in amazing ways. I know He will continue to do so. 2. I guess we’re making up for lost time and trying to catch up. And a serious note. For some reason, God has chosen to answer our prayers. I’ll never understand why. Why He has chosen to answer this one, but there are so many couples going through similar journeys and who haven’t gotten their hearts’ desire. I remain extremely sensitive to others who are walking this difficult road. And I don’t want to trigger anyone else’s sadness. The infertility journey is one that will forever mark who I am and I don’t think that will change. As of today, we are only 8 weeks along. It is obviously still early and I am not naive to think “we’ve made it”. But we also couldn’t wait any longer to share the news of these two tiny miracles with you all. So many people have been praying for us and supporting us. We are so grateful for you! Would you please join us in praising God for these two lives and also praying for their continued health and development? And maybe kick in a prayer for our wisdom and decision making about the future? We sure do have a lot to figure out! We have many more opportunities on the horizon for us to desperately lean on God in all things. On the left are our two 5-day old embryos before our transfer and on the right is our split screen ultrasound at 7.5 weeks showing our two little blueberries! Photos are by Stacey Michelle Photography. 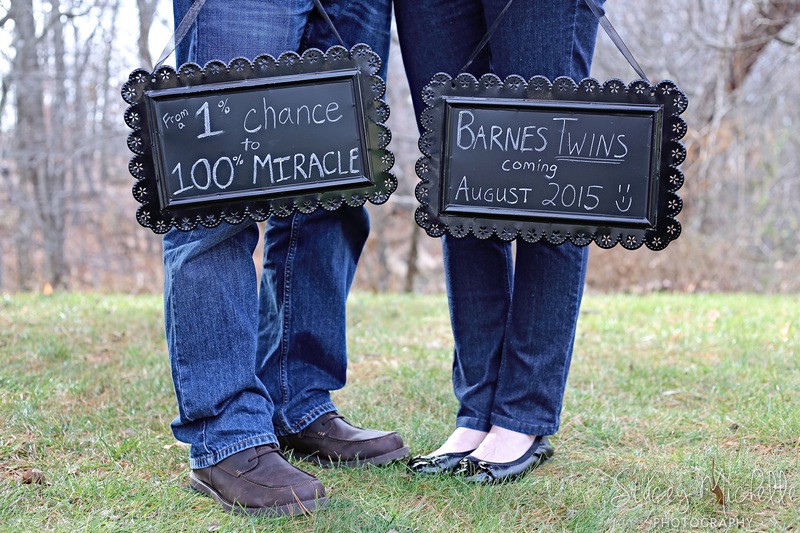 This entry was posted in Personal, Praise and tagged infertility by Karen Barnes. Bookmark the permalink. With tears in my eyes, thanking GOD for your miracles!! This is amazing! Praising God with you. I am SO incredibly happy for you all! Tears of joy are rolling out of my eyes!!! Yay!!! I am so happy for you!!! Congrats!! KAREN!!! I am so excited for you and Cason 🙂 I can’t wait to meet both little Barnes babies! Karen, Sharon and I join with others in celebrating this wonderful news. Our prayers continue for you both as you continue this new adventure of preparing for twins. I know that you both have been prepared spiritually, emotionally, physically, and mentally for the challenges of parenthood. What you are discovering already is that your twins are incredible love magnets…the bond so strong that it connects us to the source of all being, God. Here is a Celtic blessing as you continue on the path: “The blessing of Christ comes to you in the beginning…it surrounds you with joy as you welcome into your home and family unique children of love. God is here to bless you and blessed are you beyond telling, this day and every day as your children grow with you. May you find the presence of Christ to be your protection and clothing…and year by year may the knowledge of His presence be greater for you and your children. As parents who receive this gift and children who receive you as parents, we lift all of you into the light of Christ…believing with all your hearts in the love of God that holds you and them secure. God who pours blessing upon the details of their days shall bring them to the full knowledge of Jesus as Lord through your faithful witness. God be with you in this your journey, every day and every way, with your children born in His love and in the affection of heaven.” AMEN. You had me at “my God is a God of the 1%”! Our hearts are full of joy!